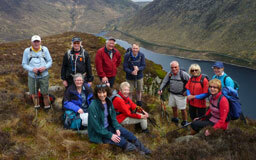 We are the Mourne Rambling Group, a hill walking club providing 2 or 3 levels of walks every Sunday in the Mourne mountains. However, please note, we are a hill walking club and you must be fit enough to walk hills and not just on the flat. How to join us? Have a look at our membership page and then contact one of our New Member officers. Note: membership of the club is open to people of 18 years or over and dogs are not permitted on the walks.